Georg-August-Universität Göttingen: 3rd Reunion of the 5th Medieval History Seminar, August 5 to 8, 2010. History Faculty, Oxford: 2nd Reunion of the 5th Medieval History Seminar, July 16 to 19, 2009. Humboldt-Universität zu Berlin: 1st Reunion of the 5th Medieval History Seminar, June 13 to 15, 2008. 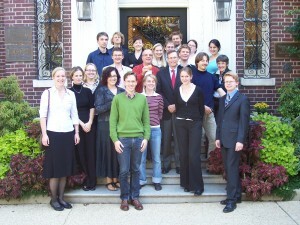 German Historical Institute, Washington D.C.: 5th Medieval History Seminar, October 11 to 14, 2007. Born 1979 in Rinteln (Lower Saxony, Germany). 1999 to 2004 studies in Medieval and Modern History, Scandinavian languages and Northern Archaeology at the University of Kiel. 2002 to 2004 scholarship from Studienstiftung des Deutschen Volkes. 8 December 2004 Master’s degree from the University of Kiel (Master thesis “The account book of the printmaster Peter Drach of Speyer (c. 1450-1504)”). 28 January 2008 PhD from the University of Kiel (Dissertation “Imperial coinage in the later Middle Ages”). 2001 research assistant with the Residenzen-Kommission der Akademie der Wissenschaften in Göttingen. 2002 to 2005 research assistant with the Professur für Wirtschafts- und Sozialgeschichte (Professor Dr. Gerhard Fouquet). April to June 2005 deputizing Assistant Keeper at Den kongelige Mønt- og Medaillesamling, National Museum, Copenhagen (Denmark). February 2006 to August 2008 Instructor (since April 2008 Assistant Professor) with the Professur für Wirtschafts- und Sozialgeschichte (Professor Dr. Gerhard Fouquet) of the University of Kiel. Since September 2008 Keeper of the Uppsala University Coin Cabinet (Sweden).